It appears Jay Cutler will not be walking down the aisle next spring. The Chicago Bears quarterback broke off his engagement to The Hills star, Kristin Cavallari just weeks before the start of football season. Cutler, now 28, was diagnosed with diabetes three years ago. He has Type 1, sometimes referred to as “juvenile diabetes,” which is a misnomer. While the onset typically occurs in children and adolescents, people of any age can be affected. Cutler himself was 25. He exhibited all the classic signs of diabetes: weight loss (he went from 238 pounds to 203 in a few short months), frequent urination, insatiable thirst, and lack of energy. As a result of untreated diabetes, his game suffered. It was not until a routine blood test (required to participate in offseason training), that Cutler learned he had diabetes. Diabetes, generally speaking, is a condition in which the body’s cells do not receive adequate supply of sugar, in particular, a sugar called glucose. When our food is digested, glucose makes its way into our bloodstream. Our cells use the glucose for energy and growth. But glucose cannot enter our cells without insulin. It is insulin which enables our cells to take in glucose. Without insulin, the sugar levels in the bloodstream rise. Type 1 may more accurately be termed “insulin-dependent” diabetes. This is because people with the condition require daily, subcutaneous injections of insulin for the rest of their lives. In type 1, the body’s immune system attacks cells in the pancreas that make insulin. Type 2 diabetes is sometimes referred to as “adult diabetes.” This is another misconception. In fact, recent studies conducted by the CDC have found that children and teenagers are being diagnosed with the disease at an alarming rate. About 95% of those children were obese at the time of diagnosis. 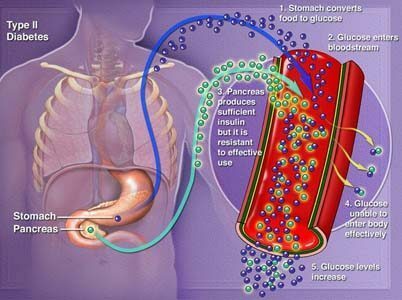 Type 2 diabetes occurs when the pancreas does not make enough insulin, suffers from “insulin resistance”, or both. Insulin resistance means that the cells no longer respond properly to the insulin present. An unhealthy weight is a major risk factor. A third type, gestational diabetes, occurs in pregnant women, and is usually temporary. Complications can still endanger the health of the woman and her fetus. There is also an uncommon medical condition called diabetes insipidus which actually has nothing to do with insulin. In diabetes insipidus, the kidneys are unable to conserve water as they filter blood. This problem arises either directly from the kidney, or from a part of the brain called the hypothalamus, which produces a hormone, called ADH, that controls water conservation. Despite the differences between type 1 and 2, the complications are often the same. The higher the blood sugars over an extended period of time, the greater the risk for complications such as blindness, stroke, nerve damage, limb amputation, kidney failure, and premature death. OR RATHER, OUR ELITE ATHLETES ARE POURING OUT OF THE USA TO GET STEM CELLS!! FOLLOWING THE PATHS OF BARTOLO COLON AND PEYTON MANNING, 37 YEAR OLD TERRELL OWENS GOES FOR STEM CELL TREATMENT ON HIS ACL IN A BID TO REJUVENATE HIS KNEE AND RETURN TO THE NFL. NFL WIDE RECEIVER Terrell Owens, refusing to abandon his attempted return to the NFL, has traveled to Asia for treatment on the anterior cruciate ligament he tore up during the offseason. Owens becomes the second big-name player to travel abroad for stem cell-related therapy after Peyton Manning went to Europe for a stem-cell procedure before his most recent neck surgery.